Homebuilders stand on the shoulders of the builders who taught them the trades. Skills pass through, and as each generation gathers new layers of knowledge — of design, materials, and building codes — the end result, especially in the case of a custom home, is a safer and more efficient, comfortable, and beautiful space to be in. Back and forth across the States in his pickup truck early on, company cofounder Bruce Giffin cut his teeth in construction under many established builders, including J.W. “Bill” Adkins (pictured above, right, with Bruce in June 2018). 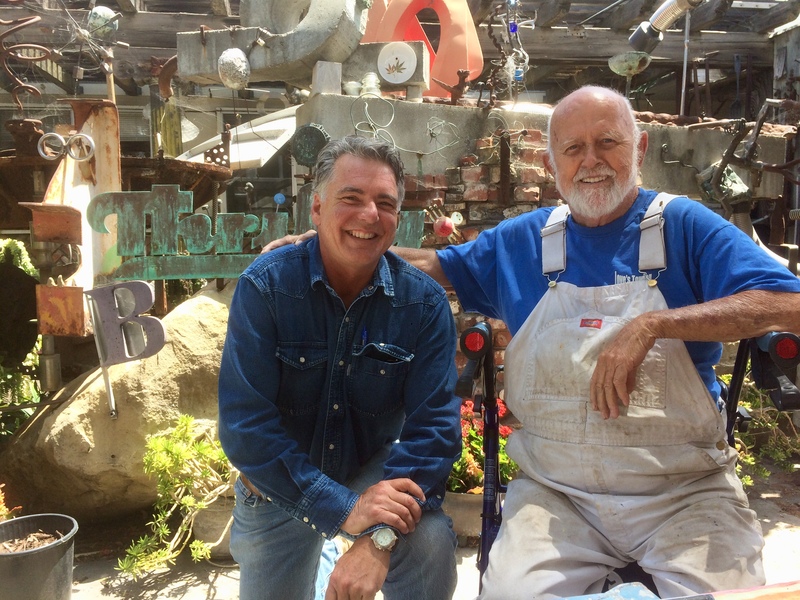 Between jobs in 1979, Bruce was driving through downtown Santa Barbara when he noticed Adkins’s shop. He pulled over and asked for work, remembering, “I think I was looking for a father figure, and he was looking for a laborer.” They worked together for about a year, but the lessons learned would last a lifetime. Bruce only got fired once in his life, and that was immediately after laughing at Bill — known for processing jobsite frustrations via bursts of screaming rage — when he blew a hydraulic hose on his old tractor after a tough day of digging. A few years later, Bill hired Bruce again, adding another layer of knowledge to the young builder’s skill set. By then, Adkins had established his own construction company after 12 years of swinging a hammer for contractor E.M. Clark. “He fired me,” remembers Adkins. “It was the best thing he ever did for me. I came home and felt sorry for myself for about 16 seconds and then went out and got my contractors licence.” Adkins took on residential projects along the South Coast, with occasional jobs in Santa Ynez and Ventura County, building on knowledge he learned from his grandfather — also a builder — who raised him in his native Lompoc, and from his stint in the U.S. Navy at Port Hueneme, where he learned to operate heavy machinery with United States Naval Construction Battalions, better known as the Seabees. Adkins transitioned to commercial building as his patience wore thin with discerning homeowners — “One time I argued for four hours over a 1/16th of an inch!” — and in 1983 co-founded with his wife Martha a downtown shop called the Hardwood Mill, where they sold exotic hardwood and did custom milling. Bill retired from construction in the late ‘80s and they retired the millshop in 2001 after gradually transforming it into an eclectic and compelling creative atelier, where Bill makes what he calls “junk art” and Martha commands a hobby space of sewing machines and tall shelves loaded with fabrics. They call it The Loft. It’s filled with Martha’s crafts and Bill’s sculptures, which he tinkers together with woodworking, welding, and metal-fabrication equipment.